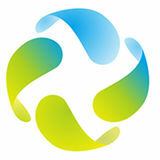 Wuhan LANDMARK Industrial Co., Ltd. 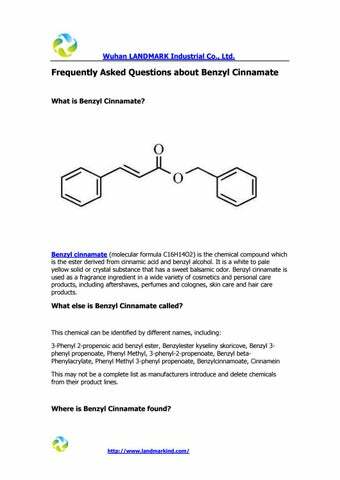 Frequently Asked Questions about Benzyl Cinnamate What is Benzyl Cinnamate? Benzyl cinnamate (molecular formula C16H14O2) is the chemical compound which is the ester derived from cinnamic acid and benzyl alcohol. It is a white to pale yellow solid or crystal substance that has a sweet balsamic odor. Benzyl cinnamate is used as a fragrance ingredient in a wide variety of cosmetics and personal care products, including aftershaves, perfumes and colognes, skin care and hair care products. What else is Benzyl Cinnamate called? This chemical can be identified by different names, including: 3-Phenyl 2-propenoic acid benzyl ester, Benzylester kyseliny skoricove, Benzyl 3phenyl propenoate, Phenyl Methyl, 3-phenyl-2-propenoate, Benzyl betaPhenylacrylate, Phenyl Methyl 3-phenyl propenoate, Benzylcinnamoate, Cinnamein This may not be a complete list as manufacturers introduce and delete chemicals from their product lines. Where is Benzyl Cinnamate found? This chemical is a commonly used sweet and floral flavoring agent. It is used in perfumes and fragrances. Further research may identify additional product or industrial usages of this chemical. Why is Benzyl Cinnamate used in cosmetics and personal care products? Benzyl cinnamate is used to impart an odor to cosmetics and personal care products. It is used as a fragrance ingredient in a wide variety of cosmetics and personal care products, including aftershaves, perfumes and colognes, skin care and hair care products. How to store and handle Benzyl Cinnamate safely? Wuhan LANDMARK Industrial Co., Ltd. Store in a tightly closed container. Store in a cool, dry, well-ventilated area away from incompatible substances. Handling Wash thoroughly after handling. Remove contaminated clothing and wash before reuse. Use with adequate ventilation. Minimize dust generation and accumulation. Avoid contact with eyes, skin, and clothing. Keep container tightly closed. Avoid ingestion and inhalation.